A stunning new contemporary design beachfront villa with sunset sea views. Amenities satellite plasma TV, DVD/CD player, WiFi broadband internet, air-con throughout, fully equipped kitchen, BBQ, Jacuzzi. 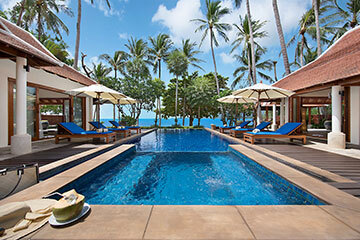 Baan Chao Lay is a sumptuous and spacious beachfront villa designed in contemporary style, and located on Lipa Noi beach, on the sunset-facing west coast of Koh Samui. With 5 en-suite bedrooms, and a vast living room, the villa is ideal for parties of up to 10 guests, offering a relaxed haven directly on the beach with every comfort and luxury. A secure and private hideaway, Baan Chao Lay is fully staffed, with a Thai chef included at your disposal to tantalize your taste-buds with exotic feasts. Entering the property through the large electric gates to a private parking forecourt, an imposing entrance leads into the inner walled garden, across stepping stones over an ornamental Koi pond. Within the private surrounds, the villa is dominated by a large swimming pool with integrated Jacuzzi facing the beautiful sea views. The pool is surrounded by a wooden deck and sandwash patios on 3 sides, furnished with sun loungers, and a grass lawn leading down to the beachfront and sala pavilion. The vast, open-plan living room features polished wooden floors, vaulted, beamed ceilings, and foldaway glass doors that open onto the pool and sea views. Furnished with sumptuous leather sofas arranged around a coffee table, and an elegant dining table, the living room is equipped with a wall-mounted plasma screen, with satellite TV, DVD, and stereo system, and is ideal for entertaining and lounging. The fully equipped kitchen is separated by a breakfast bar with bar-stools. Opposite the living room, the master bedroom includes a romantic four-poster king-size bed, plasma TV, a dressing room, en-suite bathroom featuring a sunken terrazzo tub, and a private beachfront verandah with a double daybed. The remaining 4 en-suite double bedrooms are located at the rear of the property, each with walk-in showers and private gardens. Baan Chao Lay is a beautifully designed property, including complimentary WiFi broadband internet connection, satellite TV, and stunning sunset sea views. -Additional airport transfers are charged at $50+ USD per trip for up to 9 passengers, and subject to 7% tax. 15% discount for stays in March, and 20% off stays in April. Applicable to all ocupancy rates, and cannot be used in conjunction with other promotions. Services of property manager and 3 full-time staff.